Summary: A 16-year-old girl has died. Station: WPXI Channel 11 Reporter: Katrina Owens When It Aired: Jan. 16 Running Time: 1 minute, 52 seconds Visuals: * The headline, "Drinking Death?" * A portrait of the deceased teen. Highlights: * When anchor Peggy Finnegan states, "Friends and family are mourning the death of a Kiski-area high school student. The girl was found dead in a Vandergrift home and investigators say drinking may be to blame." * When Owens boasts, "Well, Peggy, we spent the entire day in Vandergrift and all day long, people kept coming up to us and telling us about 'that girl' who died of alcohol poisoning. Well, we did catch up with two of her friends ... [who] say it was peer pressure that killed their friend." * When Owens informs us, "[T]he Westmoreland County Coroner's Office reports the teen's death is ruled suspicious. They say drugs and alcohol were involved." * When Owens asserts, "Friends of [the teen] say she must have been hanging out with the wrong crowd." * When Owens asks a male friend of the girl's, "You think she was pushed into it, then?" He responds, "Yeah, like, peer pressure and stuff like that. It's really bad anymore." Owens presses, "So, do you, do you know the people she's hanging out with now, hon?" He answers, "A little bit, and they are kind of persuading ..." * When Owens interjects, "They say [the girl] never even liked the smell of alcohol." What We Learned: Why bother with hard facts, hon, when conjecture is all the rage? Unanswered Question: A reporter has to spend all day in Vandergrift for this? News Value: 0. I'm not exactly sure of the purpose of this story. Are we supposed to be shocked? Moved that Channel 11 will spend an "entire day" to cover this? The girl's death is tragic, all the more so when local TV news turns tragedy into aimless filler with a side dish of sensationalism. Summary: Heavens to Murgatroyd! What's that falling out of the sky? Station: KDKA Channel 2 Reporter: Stacy Smith When It Aired: Jan. 17 Running Time: 32 seconds Visuals: * The teaser tag, "Fell From the Sky." * A man identified as "uncle" holding a giant blue bowl filled with ice chunks, shown twice. Highlights: * When anchor Patrice King Brown teases, "A local family could not believe their eyes when something fell from the sky and crashed into their home." * When anchor Stacy Smith reports, "A family in San Diego thought they had diamonds falling from the sky. It was instead a block of ice that crashed through the roof. Astronomers say it is a rare occurrence, but not unheard of, to have ice from the exterior of an airplane fall like this." * When Smith ends, "The family took pictures of this incident. They put the souvenir in the freezer to make sure they had the proof." What We Learned: It's never out of style to wear a hard hat. Unanswered Question: Since when is San Diego "local"? News Value: 1. Diamonds falling from the sky? Yeah, that's what I'd think right away, too. 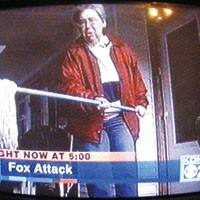 Summary: A New Kensington woman fends off a rabid fox with her kitchen mop. 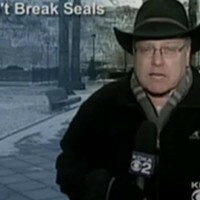 Station: KDKA Channel 2 Reporter: Brenda Waters When It Aired: Jan. 17 Running Time: 2 minutes, 26 seconds Visuals: The woman's breathless and animated re-enactment of how she fought off the fox with a mop. Highlights: * A promo for the story, depicting an elderly woman cowering behind her window blinds as the faceless male KDKA announcer voices, "Today at 5: Wait 'til you see what's been lurking in local neighborhoods, forcing families to lock their doors, afraid to go outside." Me? I'm thinking Marty Griffin. * When anchor Ken Rice teases the story for the 5 o'clock hour: "A frightening ordeal. A woman attacked repeatedly. Wait 'til you hear where she was attacked." * When Waters relays, "[This woman] says she doesn't leave home nowadays unless she's armed with a mop. It came in handy Saturday afternoon when she had a close encounter with a fox." * When Waters narrates, "[She] was returning some bowls to her next-door neighbor. She just rang the doorbell when things got wild." * During the woman's battle re-enactment, when she says, "I was hitting it with the mop. ... I kept hitting it and hitting it and hitting it and backing up." What We Learned: Maybe it's not such a good idea to return items you've borrowed from your neighbor. Unanswered Question: Is it just me, or is there a Dr. Seuss book in here somewhere? News Value: 5. I love a granny with gusto.